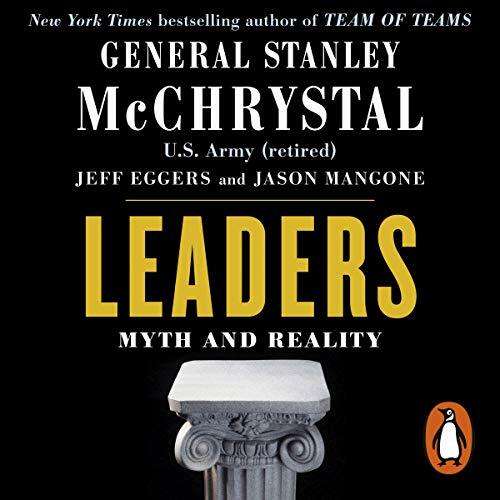 Penguin presents the audiobook edition of Leaders by General Stanley McChrystal, Jeff Eggers and Jason Mangone, read by Paul Michael. Retired four-star general Stan McChrystal has studied leadership his whole adult life, from his first day at West Point to his most recent work with the corporate clients of the McChrystal Group. In this follow-up to his best sellers My Share of the Task and Team of Teams, McChrystal explores what leadership really means, debunking the many myths that have surrounded the concept. He focuses on 13 great leaders, showing that the lessons we commonly draw from their lives are seldom the correct ones. Founders: Walt Disney built his empire thinking he was a man of the people but was actually a bit of a tyrant to the working man. Coco Chanel hid her humble background to pretend she was an aristocrat but was obsessed with making clothes for the common people. Zealots: Maximilien Robespierre whipped his revolutionaries into a frenzy through his writing while Abu Musab Zarkawi moved on the front lines of the battlefield, winning over his followers through his personal charisma. Power brokers: Margaret Thatcher and Boss Tweed, whose respective reigns depended on the networks they cultivated. Other leaders profiled include geniuses Albert Einstein and Leonard Bernstein, reformers Martin Luther and Martin Luther King Jr. and heroes Harriet Tubman and Zheng He. Ultimately, McChrystal posits that different environments will require different leaders and that followers will choose the leader they need. Aspiring leaders will be best served not by cultivating a standard set of textbook leadership qualities but by learning to discern what is required in each situation. Excelent book, for everyone and for every time.